Propeller Brewing Company is introducing it’s popular London Style Porter in 341ml six-packs. This highly acclaimed brew was first produced in 2003 and has been a strong brand for Nova Scotia’s largest microbrewery since that time. Darker craft beer offerings have seen increasing consumer demand over the past few years nationwide and Nova Scotian consumers are not an exception to this trend. Propeller Brewing Company is set to release six-packs of London Style Porter to Nova Scotia’s four private liquor stores this week. This product was originally limited to the popular “bomber” or 650ml single serve bottle. This additional format will give craft beer customers more choice. John Allen President of Propeller Brewing Company says “Recent expansions to our production line have now made it possible for us to act on what consumers have been requesting for some time now”. Six packs of Propeller London Style Porter will be released to the public on Thursday May 5, 2011 at Propeller’s Cold Beer Store and private stores shortly after that date. 650ml bottles of London Style Porter will continue to be sold at NSLC locations throughout Nova Scotia. 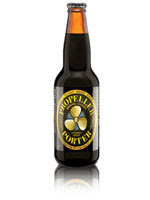 For more information about London Style Porter or Propeller Brewing Company visit www.drinkpropeller.ca. Homebrew - A Hopslam Clone Or An Abbey Ale? Untappd - brew review app.